Since cats with cerebellar hypoplasia may have trouble controlling their movements, it’s up to us to make sure that our homes are as CH friendly as possible. This means finding ways to CH cat-proof your home. Here are some basic ones I’ve come across. Please suggest your own in the comments! Remove or pad objects with sharp corners: CH cats — kittens especially! — know best how to flop against, fall on and bump into the sharpest corner or object in your house. When I first brought CG home, I was sure that he was a magnet for sharp corners, specifically those on my nightstand. It was a simple enough piece of furniture, but it had a thin lower shelf that stuck out on every side. And wouldn’t you know it? It was almost like he was drawn to those edges. 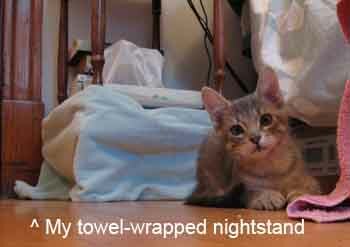 Since I didn’t want him to get punctured, I wrapped a towel around its sharp corners. He’d still flop into the nightstand now and then, but at least I didn’t need to worry as much. Another option, instead of towels, would be to use those foam pool noodles — just cut a slit in one side and slip it over the edge/corner of something. Note: You probably won’t have to do this with every piece of furniture in your home, but it may be a good idea for those that are out in the open or pose more danger than others. Be mindful of heavy, unstable objects: Just like with babies or kittens, check for heavy objects that could fall from a table if it’s knocked into or objects that could fall over if knocked into. This may include vases, stacked books, a guitar case leaning against the wall or really anything. Be mindful of these objects, and be sure to secure or move them if your CH cat is tumbling about. Beware of stairs: While some CH cats can manage stairs (usually those with carpet), others simply can’t. Keep in mind that CH cats can be very curious — especially if they see other cats going up and down your stairs. Remember, even if your CH cat can climb your stairs going up, odds are she’ll have a difficult time coming down. Until you know for sure, block off stair access with a baby/pet gate. Can she get down? : Just like with stairs, not every CH cat that can go up someplace (think your couch, bed, a cat condo) can get down safely. More often than not, when our CH kitties, CG and Ellie, jump down from the couch, bed, etc., they’ll sometimes land on 1-4 feet, but more often than not, they’ll plop onto the floor. Watch your cat to see where she likes to end up, and make sure it either has an accessible safe way down or is out of her reach. Place a pillow or carpet under her landing spot to make sure she can get some traction during her landing. So what do you do if you have a wild CH kitty that bumps into sharp corners, tips over objects, climbs stairs and reaches the top of her cat condo but can’t get down? If you can’t watch her every moment, consider a pet playpen. It’ll provide her a safe spot to play while you do your thing. Need more tips? Here are several great places to have floor coverings for your CH cat. ← Should Your Special Needs Cat Wear a Diaper? Percy, my CH kitty gets so wild several times a day. He expends his pent up energy by bouncing and flopping around and get so concerned he may give himself a concussion or worse. Perce is a severely affected CH kitty. he cannot walk. He flops. But when he gets in his moods (like he is right now) I really get worried. I take him outside once a day for a few hours to enjoy nature and the other animals, but I see him bonking his head on the concrete sometimes and it scares me. Yes, I know: keep him away from hard surfaces etc, but he finds his way into trouble. So don’t lecture. He is a wild boy! But I love him so much. There is no answer to the trouble this little boy gets into, just thought I’d share with you about Percy, my wonderful crazy CH kitty. He is a lucky little guy to have me and the rest of our little family as his family cus we do love him and I’ve had friends suggest euthanasia for him and I tell them H*LL NO! He is our little angel boy and we love him so much. He is so talented, extremely sociable and so special in spite of his disability. Quite a character, that Percy! Also, regarding Percy & playpens: I bought Perce a second hand play pen recently. Because we like to go camping and cannot leave Percy at home we use the play pen at the camp ground and he seems to really enjoy it. He cannot get in trouble, he stays clean, and can play and socialize with us at the camp site. Its great! I’ve never had a cat that enjoyed traveling like Percy does. Of course we carry him mainly in a crate, but he is also quite happy to sit with us checking out the scenery as it passes in the front seat. Percy’s personality never ceases to amaze me. he is a happy camper and a happy traveler too.